The “death cross” confirmed at the end of last week’s dramatic action, and this significant event points to the growing possibility of a new bear market. 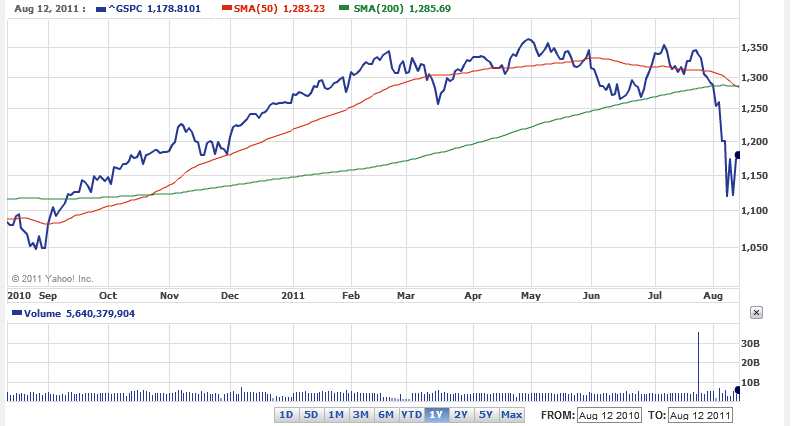 This is what it looks like courtesy of Yahoo Finance. Here is the link, http://finance.yahoo.com/echarts?s=%5EGSPC+Interactive#chart2:symbol=^gspc;range=1y;indicator=sma(50,200)+volume;charttype=line;crosshair=on;ohlcvalues=0;logscale=on;source=undefined.